Brits benefit from the largest decrease in travel prices (-25% on average) comparing to their European neighbours. Fares for international destinations decrease on average by 24%. Train fares fall on average by 40%, coach fares by 35% and airfares by 14%. 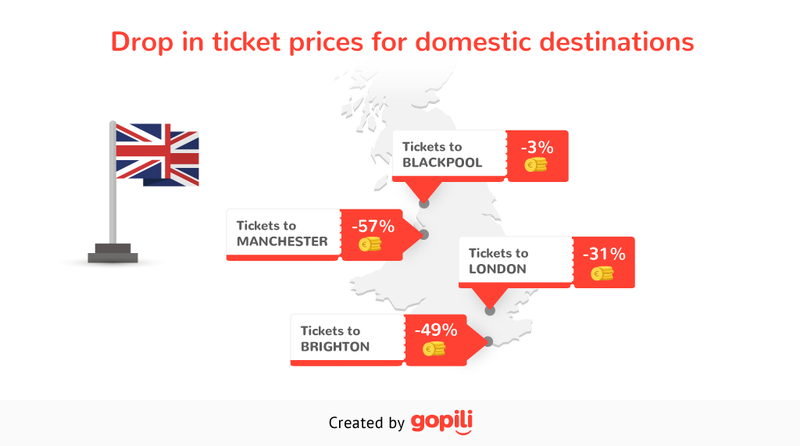 Data collected by gopili, reveals that travelling in September can help Brits to save on average 25% on their holiday’s budget. The study compared the average fares across all transportation modes, for international and domestic journeys during August and September. Only tickets booked 3 weeks before the date of departure were considered. British travelling in September are the luckiest in Europe. 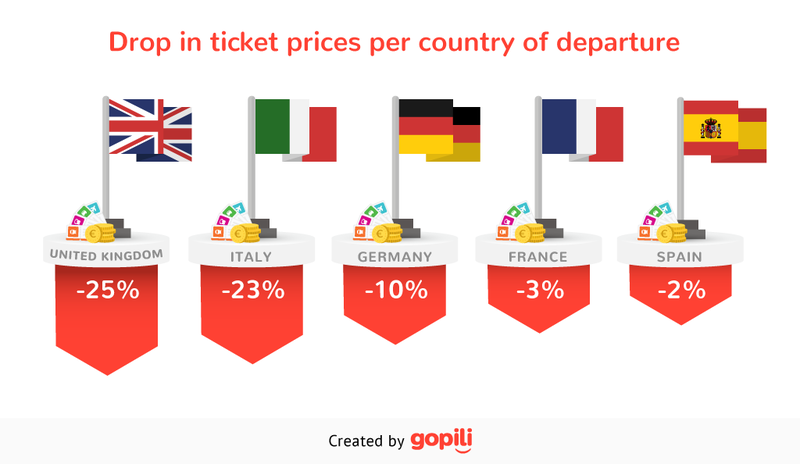 Fares from the UK have seen the largest decrease (-25%) comparing to other European countries: Italy (-23%), Germany (-10%), France (-3%), Spain (-2%). Fares to travel in September from the UK to international destinations by train, coach or plane fall on average by 24% comparing to the previous month. 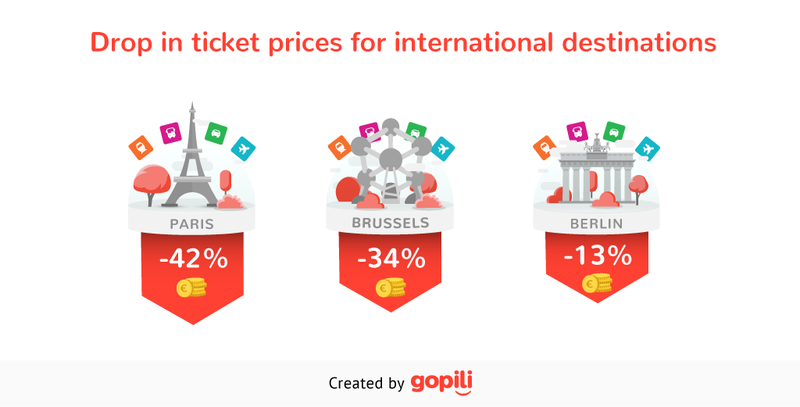 Paris (-42%), Brussels (-34%) and Berlin (-13%) are the European destinations where you can save the most in September comparing to August travellers. Inside the UK borders: Manchester, Brighton, London and Blackpool are the cities that experiment the most important fare changes. 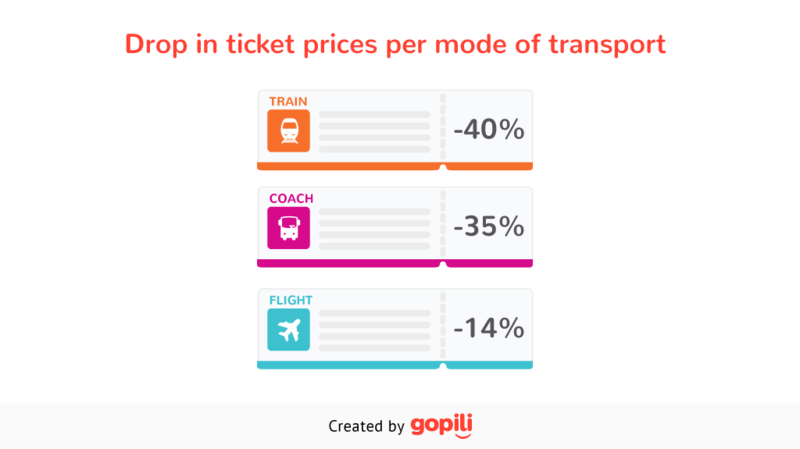 The fares’ analysis developed by www.gopili.co.uk also reveals significant differences between the fares’ evolution of different transportation modes.